Media Vince is a Web Agency dedicated to your presence online. You need a website with "all the bells and whistles" and you want it fast: contact us today and start your online business! We do development and design of websites as well as Search Engine Optimization. We specialize in dynamic content management and we make you look alive on the web by providing you tools to update and manage your business and we also help you broaden your presence by implementing multilingual systems. We build custom websites with easy to use control panel so anyone with the least interest in the technology is satisfied by its simplicity of use, alternatively as our system can also provide complex settings and fine tweaking, the more inclined will be served. Our experts in web development, Search Engine Optimization (SEO), marketing and communication have joined forces to implement the latest technologies into multimedia web 2.0 services including design, imaging, audio and video production along with translation in a panel of languages to engage your customers and incite their trust. In your valued effort of choosing Media Vince, your own products and services are to be well imprinted in the digital world! 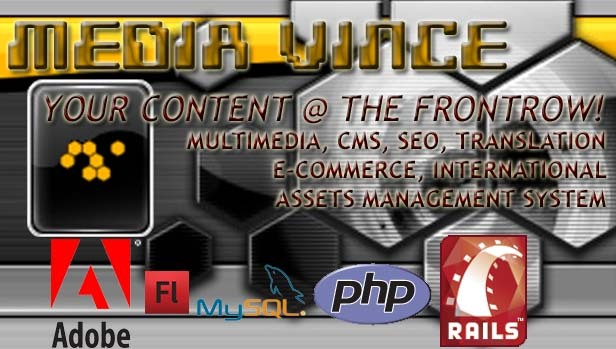 Whether it be Flash, OnDemand, Marketing, Publishing, E-newsletters or Content Management Systems (CMS); we at Media Vince are devoted to your success and promotion by using the most compelling techniques and strategies at our disposal. Request a quote for your next multimedia project here... (and why not requesting info on the hottest framework of the moment: Ruby On Rails / MVC enhanced: Model/View/Controller is the way to go!). Check it out and see some of the work developed by Media Vince! "Our website was designed to manage the database of our 300 members and all the 75 hours per week of activities of the association and also to arrange on-line registration and payment." We provide advice and information on starting or expanding a business in Italy.